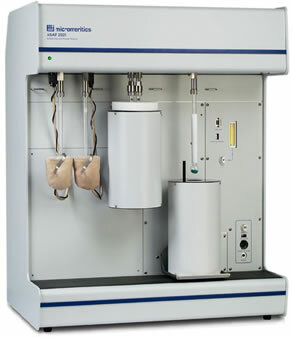 In addition to the Micromeritics ASAP 2020's ability to determine surface area and porosity, the instrument is now available with new and enhanced vapor and water vapor options. This added versatility provides researchers and formulators the capability to characterize the surface area and porosity of materials both before and after exposure to vapors or moisture, a powerful method for understanding the nature of materials. These options allow vapor or moisture isotherms to be collected from subambient to 40 °C. The ASAP 2020 vapor option provides an ideal solution for detailed characterization of materials using aggressive probes including olefins, aromatics, and other volatile organic compounds (VOCs). The vapor accessory is easily added to installed instruments or can be pre-installed on new instruments. The accessory includes a vapor source with perfluoroelastomer seals and a temperature controller for the ASAP 2020 analysis manifold. The ASAP 2020 vapor option may also be ordered with enhanced corrosion-resistant wetted materials. This option enables the ASAP 2020 to characterize large samples including tablets, pellets, granulated food, powders, and desiccant packs and is compatible with a wide range of vapors including benzene, toluene, xylene, ethers, aldehydes, alcohols, and amines. The ASAP 2020 water vapor option is an ideal tool for performing a detailed characterization of pharmaceuticals, food, cosmetics, and many other materials that sorb moisture. The accessory includes a temperature-controlled analysis manifold and vapor source. Unlike traditional gravimetric moisture analysis, the ASAP 2020 water vapor option allows the user to characterize large samples such as tablets, pellets, granulated food, powders, and desiccant packs. The moisture adsorption isotherm may be used to understand the water activity of a material which may influence chemical stability, microbial activity, flow properties, compaction, hardness, and dissolution rates. What is the cost of Micromeritics asap 2020 ?